The hike along the trail at Robert Sibley Volcanic Regional Preserve in the Oakland hills is not only idyllic, but educational. 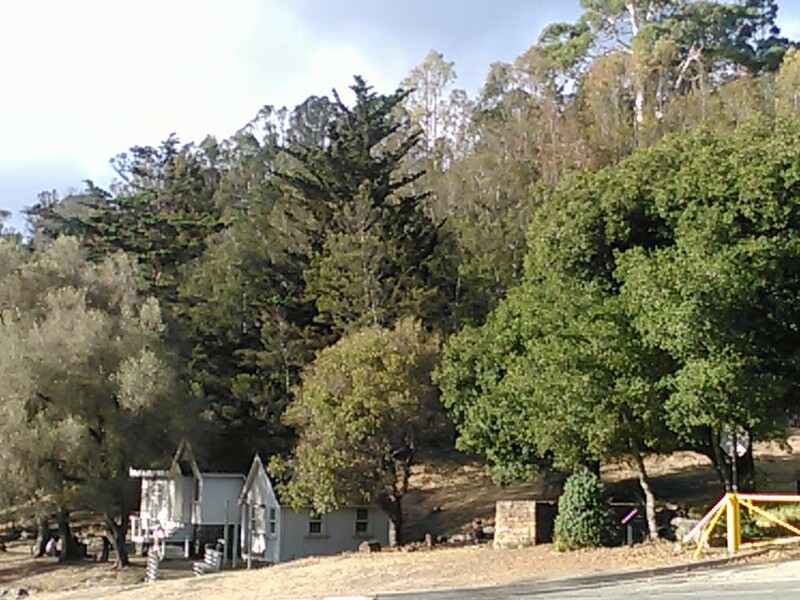 Leave the parking lot and head east upon one of its trails, and eventually, the winding path upon which you walk, made beautiful by long vistas of towering stands of Monterey Pine and Eucalyptus trees, deliver you to an area known as "Round Top." Here, you will find a historical marker bearing witness to a time 12 million years ago when standing in that location would have been impossible; for standing at that location would have placed you inside an active volcano: a hot spot born of the collision of tectonic plates which would later push the volcano skyward as the Oakland and Berkley hills emerged from sea level. A modern visitor to the region would scarcely recognize the landscape or its inhabitants. 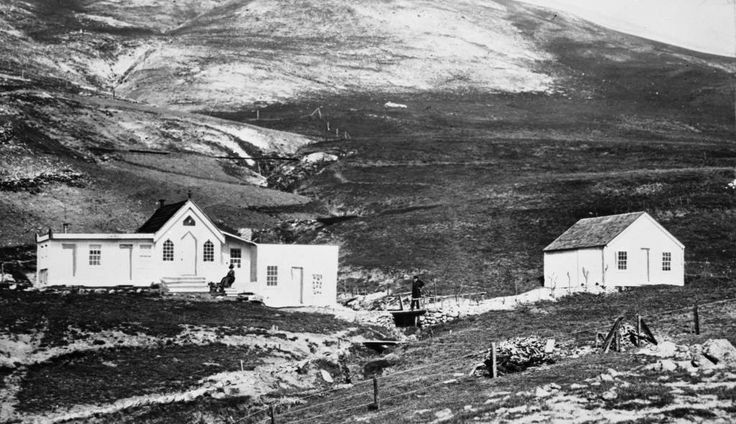 At that time, the East Bay was a warm, wet and flat savannah, inhabited by camels, rhinoceros, three-toed horses, small mastodons with four tusks, and herds of antelope-like creatures, all of whom thrived in the East Bay 55 million years after the age of dinosaurs (when the area was still part of an ancient sea), but long before humans first arrived in the region an estimated 10,000 years ago. Fossil evidence, much of it unearthed during excavations for the Caldecott Tunnel, demonstrates that over the vast distances of geologic time, the San Francisco Bay experienced a variety of climactic shifts--cycles of ice ages and warming periods which caused land to alternatively dry out and then once again become submerged in water, changing not only the appearance of the region, but the plants and animals that lived there. Eventually, the area became distinguished by a Mediterranean climate--the wet winters and dry summers we still experience today--favoring plants which could wait out unfavorable conditions. This change caused various species of grasses and other plants to diversify and evolve into new species, leading to the creation of a coastal prairie in the region. This never-ending transformation--of landscape, of climate, of plants and animals--has occurred, and continues to occur, all over the world, resulting from a variety of factors: global weather patterns, plate tectonics, evolution, natural selection, migration, and even the devastating effects of impacting asteroids. Close your eyes and randomly stick a pin on any location in a map, then do a Google search of that region's history and what you will invariably find is that at some point in time, that location looked very different than it does today, as did the plants and animals who resided there. Over 10,000 years ago, a sudden burst of monsoon rains over the vast Sahara desert transformed its dunes into a savannah which could sustain life, including people and giraffes who migrated into the area which today is once again a barren expanse of sand. Roughly 74 million years ago, Tyrannosaurs, Ceratopsians, and Sauropods roamed the continent of North America which was divided down its middle by a vast, ancient sea. In the distant past, the now frigid polar regions of the Earth were moist, temperate and blanketed by forests. The geographic and fossil records tell us that there is but one constant to life on Earth, and that is change. Humans--ourselves a force of nature given our cunning intellect and expert ability to bend our surroundings to our needs--can also alter environments, both for good and bad. When timber hungry fortune seekers arrived in droves to the San Francisco Bay Area during the Gold Rush, they clear-cut the Oak trees which gave the city its name and whose acorns served as staple to the tribes of people who themselves had arrived from elsewhere many thousands of years before. Early Oakland settlers looked about at the empty, blighted East Bay hillsides so prone to devastating fires which regularly swept across the sun-scorched, windswept grasslands and conceived of a plan; a plan which has bequeathed to us what is now one of the most spectacular and beloved natural beauties of the Bay Area: the forests of the East Bay hills. Distinguished by their lofty heights, the shady, other-worldly Edens created beneath their canopies and the dramatic, iconic silhouettes they create against a blue or fog drenched sky, Eucalyptus and Monterey Pine trees were some of the favored trees of Oakland's founders, who planted them by the millions. On the land which is now an Oakland park named in his honor (as are an Oakland elementary school and street) celebrated "Poet of the Sierras" and legendary naturalist, Joaquin Miller, set out to create an artistic haven for himself and his family, planting 75,000 trees, most of them those very species. In terms of human history within the East Bay, Eucalyptus and Monterey Pine trees play a central and starring role. Today, they are a part of our heritage and quintessentially "Oaklandish." And yet, Oakland Mayor Libby Schaaf, U.C. 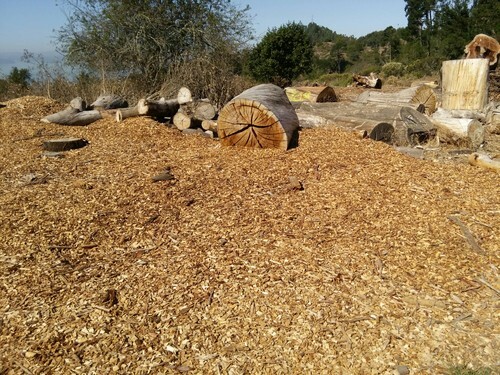 Berkeley Chancellor Nicholas Dirks, and East Bay Regional Parks District General Manager Robert Doyle are planning to clear-cut as many as half a million of these trees growing on public lands, then spray their stumps in hazardous, cancer-causing chemicals made by Monsanto and Dow Chemical. Gone will be the sheltered walking paths lined by soaring, majestic trees that are visited by thousands of nature loving Bay Area residents every week. Instead, our public lands will be crisscrossed by paths lined with caution tape and chemical soaked tree stumps that serve as grave markers to forests and beauty that are no more. Commuters traveling East through the Caldecott tunnel will no longer behold the spectacular forests that blanket the hills above the southern bore, but instead an empty, blighted hillside rendered a tragic and heart-wrenching eyesore. Weekend picnickers to Tilden Park in Berkeley will discover that the trees which lined their paths and under which they picnicked are also gone. 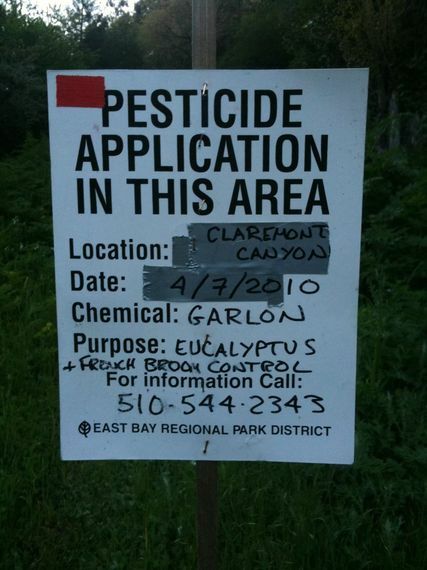 Just as alarming, the people and animals of the East Bay will be repeatedly exposed--twice a year, every year for a decade and perhaps in perpetuity--to herbicides that officials admit have the potential to cause "adverse health effects" on workers, residents, and recreational users of the parks. These chemicals have been found to cause DNA and chromosomal damage in human cells and increase the risk of Non-Hodgkin's Lymphoma. 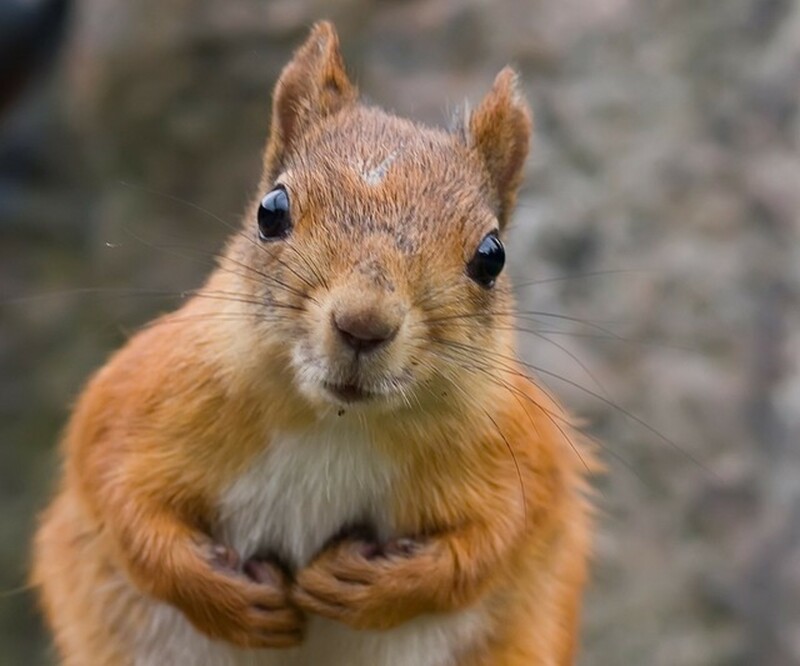 They have been proven to cause severe birth defects when tested on poor animals including rats born with their brains outside their skulls. They are toxic to birds and aquatic species, and cause damage to the kidneys, liver and the blood of dogs. Not only do these herbicides contaminate ground water, but they can persist in the environment for years, and, ironically, alter the soil by killing fungi essential to the health of Oak trees, one of just a few trees proponents of the plan will not be clear-cutting, thereby imperiling even those few trees that will be left behind. Given the drastic nature of this plan and the harm it will engender, the question, of course, is why is this going to happen? East Bay public officials have embraced an agenda to return the East Bay hills to what they claim is their "native" appearance. A goal which, in light of the history of the East Bay, inevitably begs the question: which one? Once, the region was underwater. Then, it became a savannah. And for a very long time, there were no hills at all. What makes any one moment in time the "real" one or necessarily better or preferable to what is there right now? Each species on Earth, writes Biology Professor Ken Thompson, "has a characteristic distribution on the Earth's land surface... But in every case, that distribution is in practice a single frame from a very long movie. Run the clock back only 10,000 years, less than a blink of an eye in geological time, and nearly all of those distributions would be different, in many cases very different. Go back only 10 million years, still a tiny fraction of the history of life on Earth, and any comparison with present-day distributions becomes impossible, since most of the species themselves would no longer be the same." So under what pretense does an arbitrarily picked "single frame from a very long movie" chosen for the East Bay hills trump the others? Why should the appearance of the East Bay hills be returned and be forced to forever remain the way they looked at the one, particular and arbitrarily chosen moment in time which proponents of the clear-cutting plan prefer? According to the report issued by FEMA, the federal agency funding this catastrophic destruction to the tune of $6 million, it is to eliminate forests on our public lands in order to promote their conversion to "grasslands with islands of shrubs." In other words, landscapes dominated by stands of trees that are among some of the tallest on earth and can grow up to several hundred feet high, are to be replaced by shallow grasses and the occasional bush simply because those plants grew in the region prior to the city's founding. Though this particular moment in time is deemed the preferred one by those who claim to know best on behalf of everyone else, how can the very high toll of its execution--the harm it will inflict upon those who live there now--the animals who rely on such trees for habitat, who will be displaced or forced to live in a toxic waste dump that will poison them and their food and water supply, the homeowners in the region whose families and pets will likewise be exposed to carcinogenic herbicides and the legions of visitors who visit the East Bay Regional Parks only to discover that those tasked with the trust of protecting our public lands have chosen instead to destroy them--be considered worth its cost for what is ultimately a pointless outcome, trying, in vain, to return selected areas of the hills to one of their various historical manifestations? How can such harmful and dramatic self-inflicted wounds possibly be justified, either scientifically or morally? Though Schaaf, Dirks, and Doyle embrace an agenda indistinguishable from that of the timber and chemical industries, that would, as FEMA itself admits, cause "unavoidable adverse impacts... to vegetation, wildlife and habitats, protected species, soils, water quality, aesthetics, community character, human health and safety, recreation, and noise," they are nonetheless claiming the mantel of "environmentalism" and calling their plan "environmental restoration." Underlying this and other equally shocking calls for environmental destruction across the globe is the environmental movement's embrace of "invasion biology," which regards any human induced outcomes in the world as by definition bad. The deep misanthropy underlying this troubling mindset has rendered its adherents incapable of distinguishing between human actions which are beneficial to the environment--such as the planting of trees and the creating of forests--and human actions which result in harm--such as chopping down trees and dumping thousands of gallons of toxic herbicides, and thus contributing to the poisoning of the Earth, the suffering of wildlife and the enabling of climate change. In embracing the latter, invasion biologists compel us to perceive threats to the environment where none actually exist, arguing that simply because humans were responsible for a particular outcome it must be undone. Given the vast influence of humans on virtually every corner of the globe, this philosophy compels us to declare war on the natural places all around us, and to continue to wage that war in perpetuity in order to maintain stasis of their preferred order. As the environmental movement continues to grow in influence, and as this particularly invasive philosophy continues to metastasize within it and increasingly define its agenda, we can expect that their calls for clear-cutting, ripping out vegetation, dumping herbicides and pesticides and, when it comes to those species they cruelly regard as "invasive," trapping, shooting, poisoning and otherwise brutalizing animals, will become ever more commonplace, especially as they gain influence with public officials as they have done in the Bay Area. Paradoxically, while they claim that they are working to undo the unnatural outcomes of humans influencing their environment, they don't see any conflict in inflicting their own will upon the environment whatever the cost, nor the irrationality of considering humans, a species which evolved on earth the same as every other species, as somehow outside the natural world. Given the pernicious nature of their agenda and the bad science and sloppy logic which underlies it (not the least of which is that Monterey Pines are by their own definition "native"), perhaps it should come as little surprise that they are often dishonest, as well, attempting to obfuscate their true motivation and the environmentally catastrophic nature of their plans by promoting them under more publicly palatable rationales. In the case of the East Bay hills, that rationale is claimed to be "fire abatement." 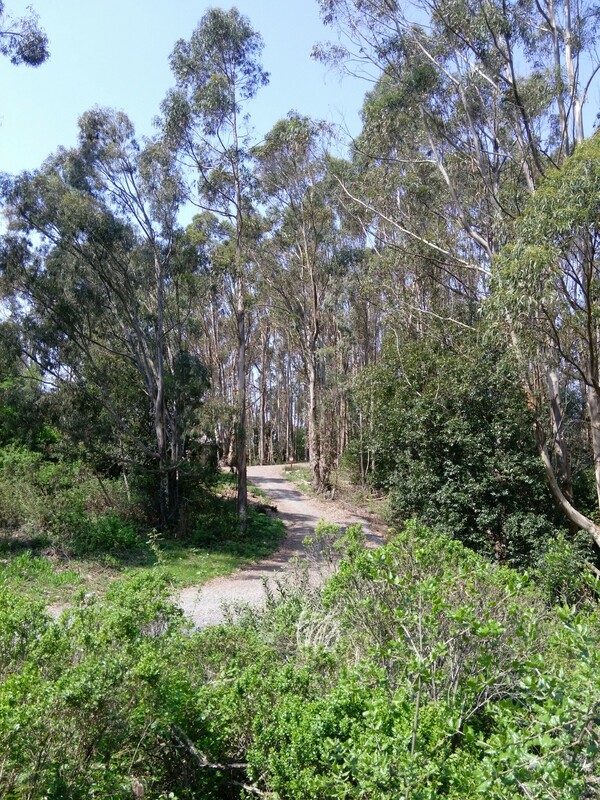 On the EBRPD website, Doyle admits that while "Conversion from eucalyptus or pine will not be accomplished easily, with transition to a grassland/brush mix, oak/bay woodland, or other appropriate native, plant community a long-term goal," he also makes plain why that is the case: lack of money and public opposition to the plan "being the main factors in determining the pace of this transition." In other words, Doyle and his colleagues on the Board of the EBRPD have to concoct a plan to substitute their own will over the public's will whom they are supposed to represent, with 90% of the 13,000 citizen comments submitted to FEMA opposed to the plan. Indeed, overcoming public resistance in one of the most environmentally conscious areas of the country to the idea that decimating numerous healthy forests, cutting down hundreds of thousands of carbon sequestering trees, displacing multitudes of wildlife and spreading tens of thousands of gallons of toxic chemicals where both animals and people live is a sound idea, consistent with an environmental ethos that has historically been associated with the antithesis of such actions, is a challenge. And in the Bay Area, where almost 25 years later the tragedy of the 1991 Firestorm can make still the most stoic eyes misty, they hope that fear mongering about fire will do the trick, while simultaneously creating a public safety rationale that will make Uncle Sam foot most of the bill for the proposed decimation. And yet when chainsaws are taken to the East Bay forests, their decimation will actually increase the risk of fire in the region. 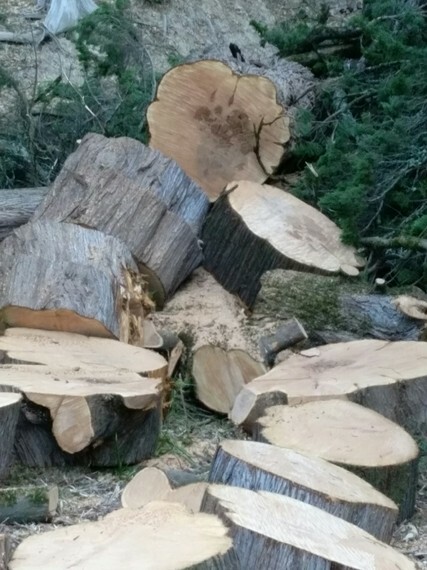 Healthy, green trees are to be chopped down and chipped; their remains spread about shade-less, empty hillsides at a depth of two feet, creating tinder boxes of hot, composting and therefore highly combustible dried wood throughout the hills. With forests decimated and no plan to replant in clear cut regions, highly flammable brush species such as French Broom, thistle, hemlock and poison oak will move into the areas, simply substituting what clearcutting proponents claim is one fire hazard with another, but not without first exacting a devastating toll on the animals and people in the region. These plants will also be sprayed with herbicides, contributing yet more poison to our public lands. Whether dead after being sprayed with herbicides or dead during the long dry season, these plants will be more flammable than the forests they replaced. Tall trees which once served as windbreakers to slow the spread of fire will be destroyed, while areas once covered with lush forests will be turned into grassland, an ecosystem in which fire plays a recurring and key role. 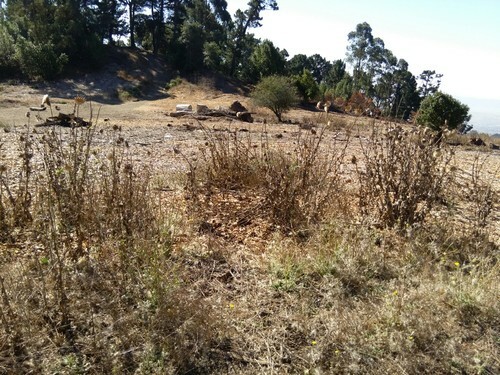 In fact, a report offering a mitigated plan of thinning the trees and reducing debris around the trees to eliminate fuels consistent with abatement techniques used in Australia where Eucalyptus trees are abundant was ignored by the city and was ultimately rejected by FEMA precisely because it conflicted with their true agenda of turning the area into "grassland with islands of shrubs." Schaaf and other members of the Oakland City Council sent a letter to FEMA urging it to reject calls for thinning in favor of a scorched earth, clear-cutting plan. Why? Because their plan is not and never was about fire. When the means by which a particular end must be sought are so cruel and destructive, common sense compels a closer look at the goal itself. If the decimation of pristine forests and the deliberate poisoning of wildlife and people in the region is the only way to achieve a stated end, then the end itself must be problematic. And when the goals of Schaaf, Dirks and Doyle are considered in light of what we know about the ever evolving and changing nature of life in Earth, it becomes clear that they have not only declared war on the byproducts of nature--certain plants and animals which have traveled or been transported from their place of origin--but on the workings of nature itself: migration, natural selection, evolution, change. Invasion biologists and those who defer to them create phantom problems where none in fact exist; instructing us to not only regard inevitable natural forces as sinister and threatening (or gentle, carbon sequestering, habitat creating, shade giving, majestic trees as pernicious and evil), but to embrace often catastrophic and self-destructive means to reach an elusive and impossible goal: holding nature in stasis to preserve a particular and favored but arbitrarily chosen moment in time. Today's environmental movement now embraces an agenda pursuing the very outcomes it was born to combat. True environmentalists working to bring sanity back to a cause that has been hijacked by a philosophy that would be unrecognizable to its early founders , those who oppose plans to destroy the forests of the East Bay, San Francisco's Mount Sutro, or wherever campaigns of destruction are being waged against plants and animals unfairly maligned as unworthy of their continued existence simply because they did not evolve in the "right" place, must stop speaking the language created by invasion biologists to fear monger and thereby confuse the public and public officials into supporting their deeply misguided and dangerous agenda. True environmentalists must stop acquiescing to the idea that every human induced change to our landscape is necessarily bad, that the planting of trees by our ancestors which have since resulted in forests that provide beauty, carbon sequestration and animal habitat are as evil as the coal fired power plant belching greenhouse gases into our skies. We must reject the notion that "native" is by definition better, that such a label carries any relevant distinction, and that it is fair to the other species who share our planet to hold them to a standard we refuse to ourselves obey. We must reject the idea that it is wise to declare a hopeless war on that which we can never change: change itself. Otherwise, we will be struggling to save our wild places from these insane assaults in perpetuity, always debating merely the catastrophic means but never the catastrophic ends. "Non-native" and "invasive species" are terms that have entered the lexicon of popular culture and become pejorative, inspiring unwarranted fear, knee-jerk suspicion, and a lack of thoughtfulness and moral consideration. They are language of intolerance, based on an idea we have thoroughly rejected in our treatment of our fellow human beings--that the value of a living being can be reduced merely to its place of origin. And when we speak these words, repeat them and pay lip service to their perceived implication that we must revere the familiar and disdain the foreign, we should not only be ashamed to do so, but realize that we are opening the floodgates of expression to our darker natures and our most base instincts--impulses which have been responsible for the most regrettable moments in human history. If Schaaf, Dirks and Doyle have their way, that will invariably include what future, more enlightened generations of Bay Area environmentalists will regard as nothing short of an historical travesty: the willful decimation of what was once of the Bay Areas' most legendary and spectacular beauties--the East Bay forests. We must reject the myopia, illogic and bad science of invasion biology in favor of reason, common sense and a broader understanding and appreciation of the changing nature of life on Earth. And we must replace the language of biological xenophobia with the language of tolerance and compassion. It is time to drive the terms "invasive species" and "non-native" into a well-deserved extinction. Jennifer Winograd contributed to this article. A version of it first appeared on Death of a Million Trees.